This Semi Final at Rochdale's Athletic Grounds was played in farcical conditions after a crush in the crowd had led to railings at the front of the stand giving way. This led to "thousands" of fans crossing the dog track at the ground to stand on the edge of the pitch. The players and officials had to push through the crowds "six or seven deep" on the touchline to make it onto the field. However, this wasn't the only problem. 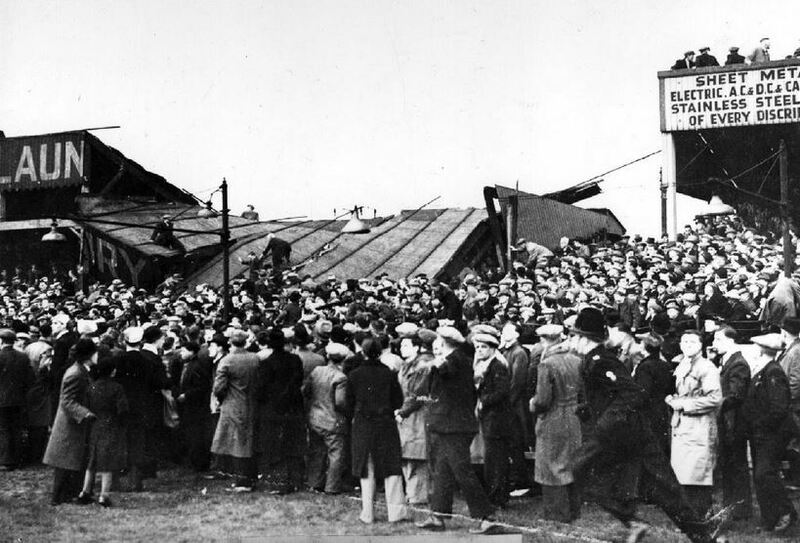 An estimated 100 supporters had climbed onto the Railway Stand roof and after a few minutes play the said wooden roof partially gave way with a "big crash" under their weight with those on the roof crashing down into the supporters below. "Many people were injured" and two of the players immediately left the field to help the injured along with ambulance and police men. Sadly it later transpired that a Joseph Howles, aged 41, of Rochdale had died in the incident. An Ann West of Eccles had also died after attending the game although it was thought she wasn't involved in the incident but died a day later after being taken ill with shock. This had been the second year in a row a Lancashire Semi Final had been played like this with similar problems at Belle Vue Greyhound Stadium when Salford met Swinton the year before. The supporters on the pitch perimeter were "perfectly orderly"and "didn't interfere with play" on this occasion but outside the ground it was been reported that latecomers had led to long queues and impatient supporters had broken into the ground without paying. In the game Salford deserved to win. Gus Risman had kicked Salford into an early 2-0 lead before the stand collapse had halted play for 15 minutes. Officials decided to continue the game, after the estimated 19 injured had been taken to Rochdale Infirmary, and following the delay Risman added a try to which he converted for a 7-0 lead. Jim Sullivan had reduced that to 7-2 on 20 minutes play and that carried until half time. The only scores in the second half were further penalties from Risman on 57 and 75 minutes which sent Salford back to Wembley where they had won the year before. An estimated 50,000 had attended the game in total. Live Commentary of the Second Half of the Match was scheduled to air on BBC Northern Regional Radio with commentary from R.A Colville. Picture of stand collapse incident taken by photographer Clifford Ashton.